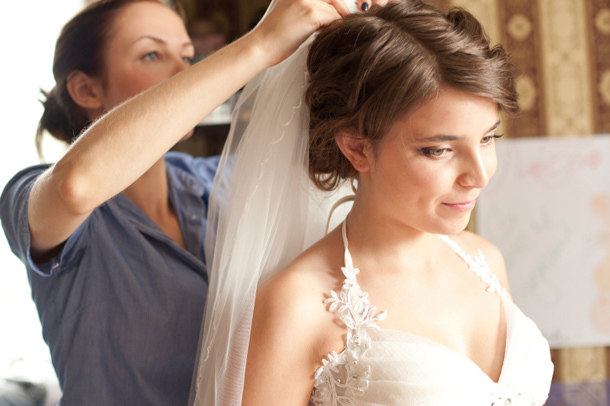 7 Exquisite Tips On How To Have Your BEST Wedding Day Hair! Just like planning the dress, the shoes and the jewellery before the wedding, brides-to-be need to prepare how their hair will look on the day. This doesn’t just mean choosing and trying out different styles, but going into the salon weeks if not months in advance to have your locks conditioned, trimmed and if need be, coloured. Wedding expert and senior director Lee Radley at Nicky Clarke shares his inside tips on how to achieve that wow factor. 1. It is important to leave enough time before your big day to consult your hairdresser to discuss things such as conditioning, colour and trimming to ensure your hair is in its best condition for your wedding. I would advise to go and see your hair stylist at least 6 months before hand in case you want to grow your hair out. 2. If you are planning on adding some highlights or a permanent colour to give your hair a glossy and beautiful finish, I would advise the bride-to-be to have this done two weeks beforehand in case it needs more or less. Having your colour done the day before could leave it not looking as good as you hoped it would be. 3. If you can give your hair a rest from over processing, apply some colour glazes, semi-permanents or vegetable colours in between permanent colour treatments/highlights. 4. If your hair is a little damaged from overuse of heated appliances such as straighteners and hair dryers, I would advise brides to use a conditioning hair mask once a week. Apply the mask over the entire hair and leave on overnight and wash off in the morning. For a more intense treatment visit the hairdressers who usually offer a deep conditioning treatment. 5. It’s a myth that letting your hair dry naturally is good for it, as the cuticles are up and this makes the hair dry out more easily and keeps the follicles open to the elements and pollution. 6. Sea kelp and vitamin B is proven to be good for your hair, skin and nails. These can be found in most health stores and chemists and do help. Also consider a Brazilian blow-dry to help tame those wild and rebellious stubborn hairs – it will enrich your hair with keratin and help it stay super glossy and strong. 7. It really is all about working with a hairdresser you can trust to get you and your hair looking its absolute best ever. Condition is the key, and get ready to make people gasp.